One thing I find about this business is that, from time to time, a good many of us can get a little too hung-up on the titles and trappings. This is a very human thing, of course. However, you can only read so much of Matthew 23 -- whatwith the Big Boss' warnings about widenened phylactories, lengthened tassels and admonitions against succumbing to the pungent seductions of "places of honor at banquets, seats of honor in synagogues, greetings in marketplaces, and the salutation 'Rabbi'" -- without scratching your head at the gulf that, in some places more than others, seems to separate the Lord's doxis from our praxis. In light of this, a comment was recently posted to the Eminent Blog, addressed simply to "Sean." The commentor expressed his "trust and hope that" the cardinal-blogger is "urging people" to ditch their use of the style "Eminence," noting that he is "but a servant leader, not a king in a castle." Such are the times that one can only wonder what some of our fresh-faced ones -- who tend to see red as oppose to wearing it (publicly, at least), and whose style can oft be far from eminence -- would do if they received such a message. Odds are that it'd be, um.... Just let your imagination run wild. Then multiply it by six. To the rescue -- and his further credit -- the archbishop of Boston replied, and the response is worth noting. In the Church we have these titles as well. When I was in the West Indies, bishops were called “Your Lordship.” As I always say, being called “Your Lordship” and driving on the left-hand side of the road were two of the biggest challenges of my life. As Franciscans, the only title that we use is brother or friar, and to me that is the most important one. However, we are part of a Church with many ancient traditions. Some of these titles, although they sound a little quaint, are reminders to us of the wonderful history and great traditions in the Church. We’ve been around for a long time, and the roles of cardinals and prelates have changed greatly. 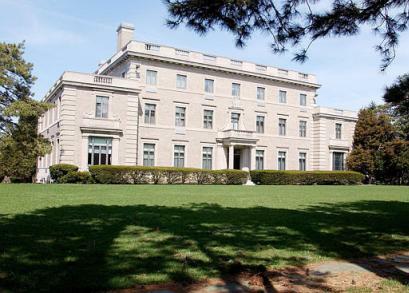 When I sold the archbishop’s residence here in Boston to compensate victims of clergy sexual abuse, it was a typical old-fashioned episcopal palace. There was a time when, for Catholics, that was a great source of pride and a source of security. It expressed for them the feeling that their leaders were important, too. But in our modern times that symbol was no longer necessary or appropriate, so I was very happy to jettison it. Yet, I don’t think we can try to erase our history or try to reinterpret symbols that in different times and places can have validity. "[I]n our modern times" the Big House (shown below) "was no longer necessary or appropriate." Wow. That'll still be news to a lot of people. All together now, friends: "Sic transit gloria mundi."